Held in conjunction with First United Methodist Church and the Nacogdoches Ministerial Fellowship. The services are held during the noon hour each day during Holy Week followed by lunch for a nominal fee. The minister and members of the church participate by preaching, ushering and leading the singing on one of the days. 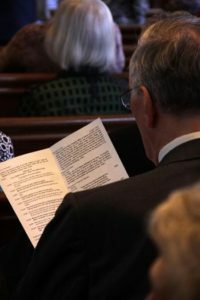 A service held on the Thursday before Easter at 7:30 p.m. when the choir offers their hard work to God and celebrates the Sacrament of the Lord’s Supper. A service of Tenebrae, this service is a very important time when we remember God’s sacrifice for us on the cross. Held on the Friday before Easter at 7:30 p.m.
Our communion services held at 5 p.m. and 7 p.m. on Christmas Eve with special music. On the first three Thursdays in December, Westminster Presbyterian Church presents the Mid-Day Noel Concert Series during the noon hour. The concert is free, but there is a charge for those who stay for lunch.